We're in the final stretch of the current journaling class and what a delight it has been getting to know these lovely ladies. We've laughed, we've created, we've eaten delicious goodies, made new friends and grown in the Lord. It has been wonderful to see the creativity poured out on the journal pages as these ladies think through the things which the Lord put in each of them to make them awesome and unique individuals. Every one of us has a unique story to tell. We all have things in our pasts, whether hurts, trials or victories which have added to the person we are. We all have unique gifts and talents which blossom when we are being the authentic person we were meant to be. In this class participants are able to think through all these things and more and get them onto a journal page in a creative fashion. If you have interest in attending a class, learning more about upcoming classes, or having Shelley come to teach any of the classes to your ladies group, please contact us at becauseliada@gmail.com. Here are some more photos from the current class. What does Because Liada mean? It comes from a quote from Helen Keller who said, "Life is a daring adventure, or nothing at all." I love that quote and I think it pretty much sums up how God wants us to live this life He has given us. He wants us looking for that wow in every day. He wants us living an abundant, fulfilling life. But He also wants us to move beyond our pasts and be the child of the King He created us to be. Why? Because Life Is A Daring Adventure, Because Liada. Because Liada also is the name of a bible study we are in the process of putting together. It is a creative, bible based, journaling and artistic adventure. I am so excited about this study. Each lesson has a creative project which goes along with it. If you have feelings of inadequacy in regards to your creative or artistic abilities, there is no need to worry, anyone can do these projects, and all instructions will be included. While this study has been fun to write, it has been even more fun to play with all the art supplies as we work through the lessons and match up the perfect creative project with the bible lesson. This study will challenge you as you discover the awesome authentic, unique individual God created you to be. If you are interested in hearing updates as Because Liada progresses or possibly on being part of the launch team please email us using the form below. We will be looking for a select group of people who are willing to trial run this study and report back to us on the lessons and the art projects etc. 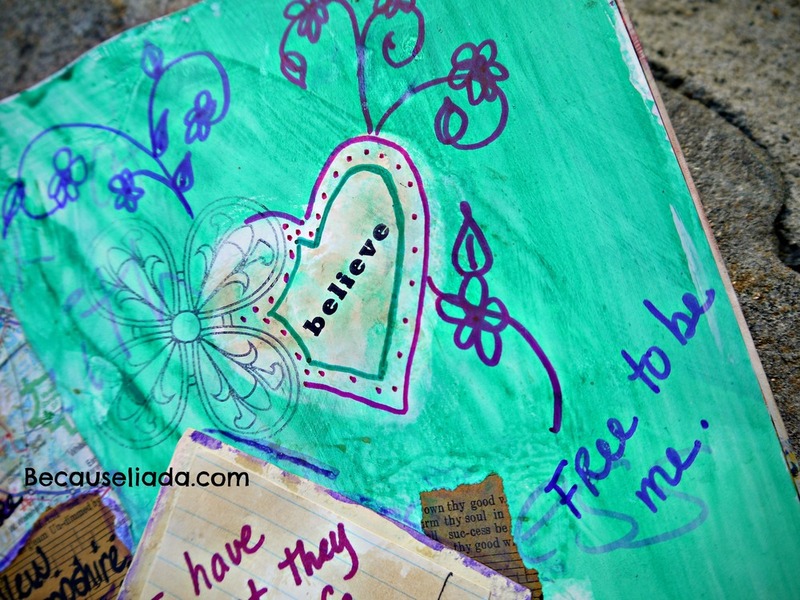 Mixed Media Journal Art Page - I do not remember crayons being this much fun! My daughter and I have been having a blast trying out different art techniques. The bible study I am in the process of writing has a different mixed media art journal page which you create to go along with each lesson. We've had fun experimenting with the art mediums and techniques to find which ones go best with which lessons in the study and well, you know, just playing with art supplies. But...Oh my goodness did we have fun with this new technique...and as I said before, this makes crayons even more fun as an adult! Then to top it off, I had these vintage ledger pages from a tobacco manufacturers cigar ledger which I purchased and they have that oh so perfect vintagy discoloration which is just delightful. I am really excited about this study, it walks you through the process of learning about yourself, about learning who you are as a child of the King, finding out what your spiritual God given gifts are, embracing your life story and giving God victory over past hurts. 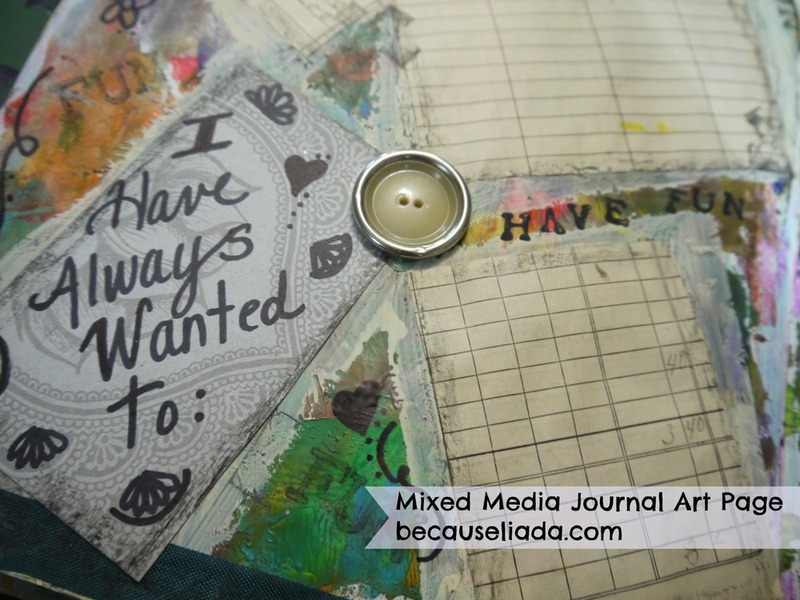 In the process of working through the study, you create a mixed media art journal which is uniquely you, uniquely your life story. I can't really get into how this page was done right now, but all the directions will be in the study. I will also post directions on the blog for a couple of the techniques eventually. It has been fun to work on creating my own book, to lay out my life story in this manner and really think about who I am as a beloved child of Christ, but it's been especially fun to figure out the techniques for you all to use to create your own personal journal. God does not want us living stuck in a rut being dragged down by our pasts, He wants us living a victorious life. He wants you to know about all the awesome, unique, hand selected gifts He has put inside you and He wants you using them. He wants you to believe you can do it, because you can through Him, and He wants you to be free to be you, to take flight and be all you can be. If you are interested in hearing when this bible study is finished, just email me and I can put you on the email list. In the meantime....go...live life abundantly, and if you haven't been living that way, start today.